With a few of my earlier posts, I have covered some of the professional ball players who temporarily traded their professional flannels in exchange for a uniform of the armed forces. While some of these men filled the ranks both in combat and support units, others used their professional skills to provide the troops with a temporary escape from the harsh realities of the war by providing them with a taste of home that can be found within the lines of the baseball diamond. According to Gary Bedingfield’s extensive research, more than 4,500 professional baseball players placed their careers on hold in order to serve in the effort to defeat fascism and tyranny that was sweeping across Europe, Asia and the South Pacific. There were more than 500 major league ball players who served in the armed forces throughout the more than four years of the war (including the last few weeks of December, 1941 when many players like Bob Feller rushed to enlist). Conversely, there were roughly 2,800 men who continued to play major league baseball during the same period, avoiding service for a myriad of reasons (age, unfit for duty, etc.). I have focused this blog on two over-arching subjects; baseball militaria – items used on the diamond (or in relation to it) by servicemen who may or may not have played the game professionally; the people who played the game during their time in uniform. Today’s post, while centered on a contextual (to this blog) object, it also addresses one of the nearly 3,000 MLB players who never served and yet was well-represented on the diamonds across both the European and Pacific theaters during WWII. Before I delve into the subject matter of this article, I must first offer a disclaimer that I am decidedly not a baseball glove collector nor do I possess any measure of expertise on this very interesting area of baseball collecting. With this being the Chevrons and Diamonds blog where I provide research and insight pertaining to baseball militaria, my interest is more broad. As I researched this topic, I realize that expertise in military gloves and mitts are significantly more specialized and as with other areas of military baseball, is limited (at least that is my assertion) as compared to baseball gloves outside of what was used during the war. As a Navy veteran, I tend to focus my collecting interest around naval-themed items and within the realm of military baseball, I remain consistent. When I began looking at obtaining a baseball glove for my collection, I found a World War II vintage model that was rather ragged and yet held my interest as it was stamped, “U.S.N.” across the wrist strap. Before making the purchase, I took note that the glove was also missing the web between the thumb and index finger and that there were fragments of the leather lacing remaining protruding from a few of the heavily-oxidized eyelets. I considered the condition and weighed it against the current pricing trends and decided to make the purchase, thinking that I would be able to get the glove into shape. From a distance, this glove doesn’t appear to be in the poor condition that it truly is. The first few treatments of the leather has yielded positive results and yet it will never truly be a showcase piece. The wrist strap is slightly rolled over the “U.S.N” stamped lettering. Notice the missing webbing and lacing between the thumb and index finger. U.S.N. is stamped into the wrist strap of this 1942-44 GoldSmith DW Elmer Riddle signature model glove. The leather on the backside of the fingers is in the best condition. Treating the finger-leather resulted in making the glove considerably more supple. The pocket and lacing are clearly absent from my US Navy-stamped GoldSmith Elmer Riddle DW model glove. On the glove’s heel, the “DW” letters are more visible just above the “Hand Formed Pad.” The lacing eyelets are not as corroded as those for the webbing. The leather shows signs of cracking and flecking off. The dark spots, in my opinion, are mildew or mold areas. Barely discernible in this image, “Inner Processed” can be seen at the center of the palm; “A Preferred Product” trademark and “DW” are visible just above my fingertips and the “ddle” of Elmer Riddle’s signature can be seen towards the upper right. Notice the cracking and flaking dried-out leather. This was after one re-moisturizing treatment. Inside the glove, the horsehide interior is not as dried out and damaged as the areas exposed to the elements. When the glove arrived a few days later, I unzipped the two-gallon sized zip-locked bag to find not only was it, at one point water-damaged with remnants of mildew or mold, but also that the leather was dried and cracking. It was in far worse shape than I anticipated. Perhaps this was the reason that I was able to acquire it for less than so many other of the scarcer Navy versions had been selling at premium prices in the months prior to me pulling the trigger on this one. In the few years since, only a smattering have since been listed in online auctions. Regardless, this dried out, cracking and smelly glove is now in my possession and it is my desire to attempt to breathe new life into it with the hope that I leave it in better condition than when I received it. I broke one of my self-established collecting rules; before I purchase it, I had virtually no understanding of vintage glove models, styles, manufacturers or the many details that a true glove collector can recite with ease. My extent of knowledge stems from examining vintage photographs and taking a peripheral view into what a fielder or position player may have on his catching hand. To me, the all generally appeared the same. Until I began researching for this article, I hadn’t spent any time attempting to understand how diverse and expansive vintage baseball glove field really is. In the coming months, I hope to take some deeper dives into this area of collecting as it pertains to military service teams and the gloves that were issued to the members of the armed forces. These letters were not visible until I treated the dried out leather a second time. Close inspection of the surface of the leather reveals the degree of the damage. The discoloring of the leather and the dryness completely concealed Elmer Riddle’s signature (along with the “Trademark” lettering). 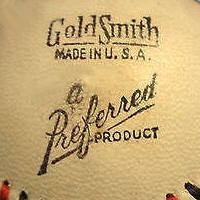 Notable in the 1938-44 GoldSmith logo, “A Preferred Product” is visible at the top of the glove’s heel (directly above the “DW”). This GoldSmith logo (as shown on the Pete Reiser JCL model glove) is what was once prominent on my Elmer Riddle model (imagesource: eBay image). After a cursory pass in working over the dried leather of my Navy-issued glove (with Horseman’s One Step Leather Cleaner & Condition), I began to see some of the markings that might lead me to determine the manufacturer. One of the obvious markings was the “DW” stamped just above the heel. After nearly two weeks (following the treatment of the leather), more of the manufacturer’s stampings and markings began to emerge as the leather became supple and started to return to its previous shape. Beneath the DW, “Hand Formed Pad” was discernible. Towards the pinky-finger side of the palm, remnants of a signature were visible – “Riddle” with “Trademark” centered directly below. A quick search of the web revealed that the glove was a GoldSmith Elmer Riddell fielder’s glove model. The 1938-1944 P. GoldSmith company logo along with the “a Preferred Product” tagline as printed on a vintage baseball (image source: KeyManCollectibles.com). To properly date the glove, the logo is the most revealing aspect (which, in the case of my glove is partially discernible). As with so many companies, logos changed during significant events (such as mergers, ownership changes, spin-offs, etc.). Noting that my glove has the GoldSmith logo along with the “A Preferred Product” trademark, it predates the merger with the golf brand, MacGregor which occurred between 1945-46 (in 1946, the company changed their name and logo to MacGregor-GoldSmith). By 1952, The company was known solely as MacGregor. Prior to 1938, the company logo was different and the name was P. GoldSmith (named for its founder, Phillip GoldSmith). Considering the company name and logo, I am able to determine that the manufacturing date of the glove lies somewhere in the 1938-44 range. There is still more information that will narrow this date range down. The glove has a major-league pitcher’s endorsement (as indicated by the signature that is embossed), Elmer Riddle who played from 1939 to 1949 with the Cincinnati Reds and Pittsburgh Pirates. His best years were 1941, 1943 and 1948 (his only all-star season). Most likely, Riddle signed an endorsement deal with the P. GoldSmith Company during the early part of the war in 1942 following his ’41 19-2 season (he was the 4th runner-up in MVP balloting). With all of the information at my disposal I determined that my glove was made between 1942-44. Aside from my brilliant deduction skills, I am also fairly adept at tapping into available resources and knowledgeable experts. I reached out to a fellow collector who has a fantastic wealth of information in his site, KeyManCollectibles.com, specifically his Baseball Glove Dating Guide. In the process of learning about this particular glove model, I made an interesting discovery. As war was taking hold across Europe, American citizens began to change their stance regarding the conscription (or draft) of young, able-bodied men into compulsory military training as a means of preparedness for what was seemingly inevitable; the United States being drawn into war. With President Roosevelt’s signing of the Selective Training and Service act of 1940, the first U.S. peacetime military conscription commenced requiring all men aged 21 to 35 to report for 12 months of service. By 1941, the age range was expanded, reducing the minimum age to 18 and the upper age to 37 and extended the length of service to 18 months. As I viewed Mr. Riddle’s stats, I took note that he had no broken time during the war which stood out as a curiosity considering that he was a 27 year-old athlete who was actively playing baseball. While many of his peers were helping with the war effort (away from professional ball), Riddle continued to play the game. During the 1943 season, Elmer Riddle had a very productive season, making 36 appearances (starting 33 games) and winning 21 (he completed 19). In 260 innings, he only surrendered 6 homeruns. How could he have avoided the draft (provided he didn’t volunteer)? There are a number of deferments that were applied to a large number of men who fell into the age range of selective service. One thought that often arises when discovering a person who didn’t serve during WWII is the only son or only surviving son provision within the Selective Service Act (the premise of the fictionalized portrayal of retrieving a sole surviving son in the film, Saving Private Ryan). However, this provision only applies to peacetime conscription. During a national emergency or Congressionally declared war, even sole surviving and only sons will be called to serve. What is baffling is that even Riddle’s older half-brother, catcher Johnny Riddle, played along side Elmer in Cincinnati, avoiding service in the armed forces. While Elmer Riddle never served his country in the armed forces, his name, affixed to a lot of baseball gloves, saw action wherever GIs took breaks from combat action. According to Vintage-Baseball-Gloves.com, the GoldSmith DW Elmer Riddle glove is, “THE (sic) classic wartime glove. More of these were issued than all other models combined.” I can almost imagine players like Joe DiMaggio and Pee Wee Reese donning an Elmer Riddle glove as they took the field in one of their many service team ballgames. While most collectors might not enjoy it, I do see the lovely irony. A few collectors noted that the initials in reference to models pertain to the original player for whom the signature model was created. Consistency is king in helping archaeologists, archivists and researches to easily map out how companies conducted their businesses and yet seldom do we find that they were consistent. As noted in the very brief sample of the GoldSmith/MacGregor-GoldSmith glove model list, the DW model did not have a ballplayer for whom the letters represented. It is assumed by collectors that it was created for Dixie Walker (most notable with his tenure in Brooklyn) and yet the glove he ended up endorsing was the (MacGregor-Goldsmith HC model (formerly the Harold Craft model). Why was the first player signature glove for Elmer Riddle the DW model rather than an ER?